I was making my usual to-do list of Passover desserts the other day, and I realized that all of them contained nuts, mostly in the form of almond meal. I am not hosting Passover dinner this year, but I am making all the desserts for both seders at my mother-in-law’s house and we do have someone coming who has a nut allergy. Although the parents of the young man with the allergy were gracious and encouraged me not to go out of my way to make anything special for their son, I would never hear of that. Passover is already a challenging 8 days. I can’t imagine depriving anyone of more than is necessary! It also reminded me how many people are faced with a nut allergy (I know there are soooo many allergies out there, of course.) 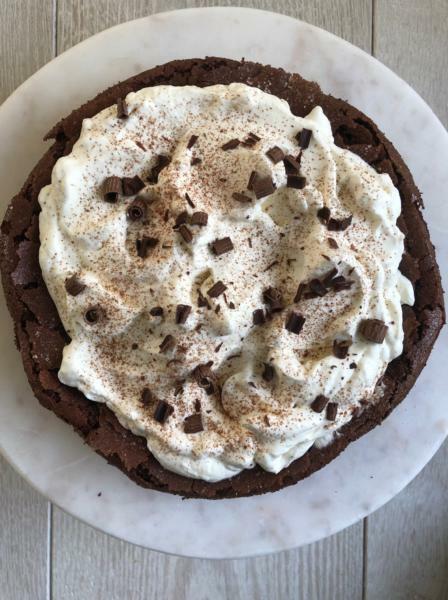 So I decided to share one of my favorite nut-free, but also Passover-compliant desserts, Fallen Chocolate Cake, also known as Flourless Chocolate Cloud Cake. There are many variations of this recipe, which is based on a recipe by Richard Sax. I have made several of them including one from Martha Stewart and this one which is adapted from Bon Appetit. I have made it for years, although usually for dinner parties and strangely not for Passover. 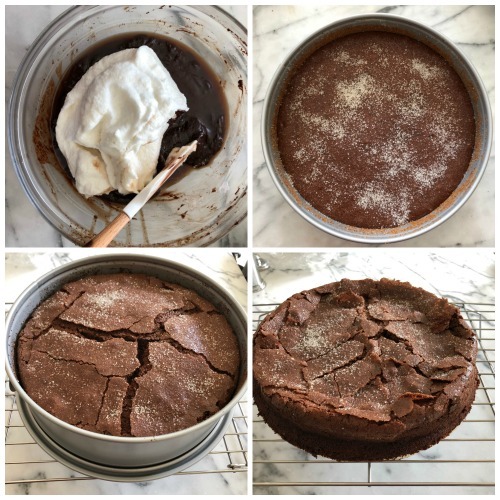 It is a richly chocolate, but ethereally light cake with a crackly top that sinks a bit after it comes out of the oven, hence the name “fallen” chocolate cake. 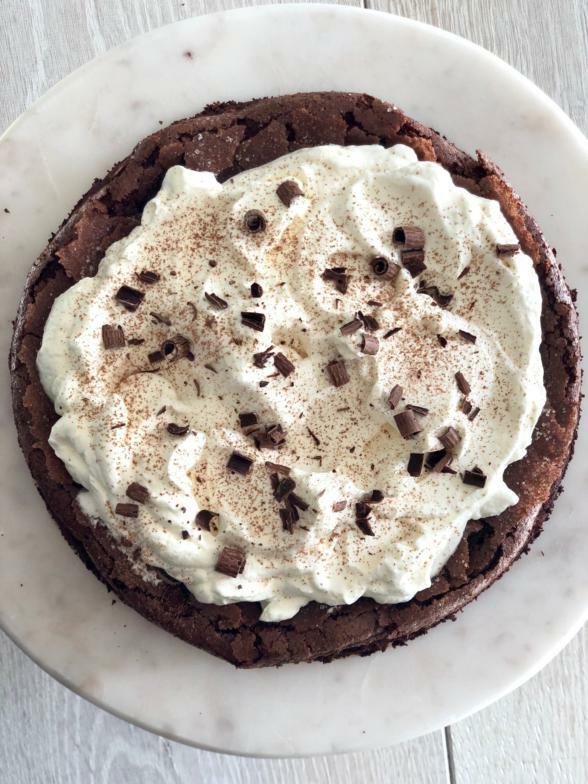 The resulting crater is the perfect place to mound soft peaks of whipped cream, hence the name “Chocolate Cloud Cake.” The whipped cream on top might seem excessive, but it actually serves to cut some of the richness of the chocolate flavor. I usually serve it on the side with or without berries, because if there are leftovers, the cake holds up better without the whipped cream on top. Once I added a Tablespoon of Amaretto to the whipped cream and that was amazing! Other desserts I make for Passover include coconut macaroons, this lemon ice torte with strawberry rhubarb sauce, this cashew cheesecake, banana-carrot muffins into a cake (but this grain-free carrot cake is a total winner), and chocolate zucchini cake which is a favorite with the kids. Plus a fruit platter. I am working a lot next week including a TV appearance on Friday, so I actually have all my desserts in the freezer already, except the macaroons. My mom is visiting this week and she has made them a million times, so I might ask her to help. I know you’ll enjoy this cake. Feel free to shoot me any holiday questions about your Easter or Passover menus. And please keep tagging me on Instagram @pamelasalzman so I can see all your creations. It is such a pleasure for me to see your images, you have no idea. Totally makes my day!!! Grease a 9" springform pan with butter and dust with coconut sugar, tapping out any excess. 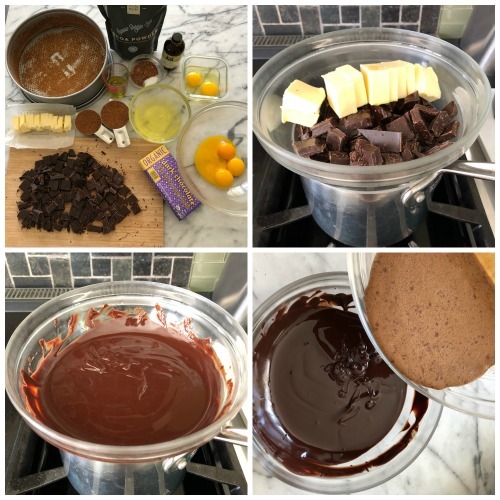 Combine chocolate, oil, and butter pieces in a large heatproof bowl. Place the bowl over a saucepan of simmering water and melt, stirring often. Remove bowl from saucepan and set aside. Add the yolks to a medium bowl and add cocoa powder, vanilla, salt, ¼ cup sugar, and remaining 2 whole eggs and whisk until mixture is smooth. Slowly whisk yolk mixture into chocolate mixture and combine well. Using an electric mixer on high speed, beat egg whites until frothy. With mixer running, gradually add remaining ½ cup sugar; beat until firm peaks form. Bake the cake until the top is puffed and cracked and the center is no longer mushy, about 40 minutes. Be careful not to overbake the cake. Cool the cake in the pan on a wire rack. The center of the cake will sink as it cools, forming a sort of crater. When ready to serve, whip the cream with the confectioners’ sugar and vanilla until not quite stiff. Using a spatula, carefully fill the sunken center of the cake with the whipped cream, spreading decoratively. Sprinkle the top lightly with cocoa powder and chocolate shavings, if desired. Run the tip of a knife around the edge of the cake, carefully remove the side of the pan, and serve. 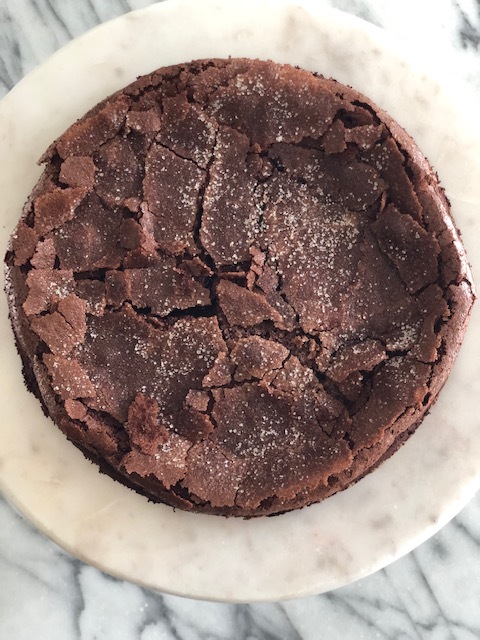 To make a dairy-free version of this cake, sub a good quality vegan butter like Miyoko's Creamery (although it's not nut-free, so use Earth Balance as a 2nd choice) for the dairy butter. And make a whipped coconut cream (search my site for a recipe) in place of the regular whipped cream. Thank you! My sister made this for Passover after is sent it to her and it was universally loved. Wonderful recipe that we will be making for many family gatherings to come in the future. How wonderful! Yes, it’s not just great for Passover. I’ve made it for many a dinner party, too! Should I freeze it after it has cooked in or out of the pan ? To defrost just leave it out or in the refrigerator to defrost? If you can spare having the pan in the freezer, freeze it covered in the pan. Defrost in the fridge the morning you want to serve it. Pull it out of the fridge a few hours before you want to serve it.